In July or August I think about how many months I have to wait before getting our tree. I love everything about the experience. I think that is due to very good childhood memories at Christmas tree lots. But usually the day after Thanksgiving I put a few decorations up before the tree hunting outing. 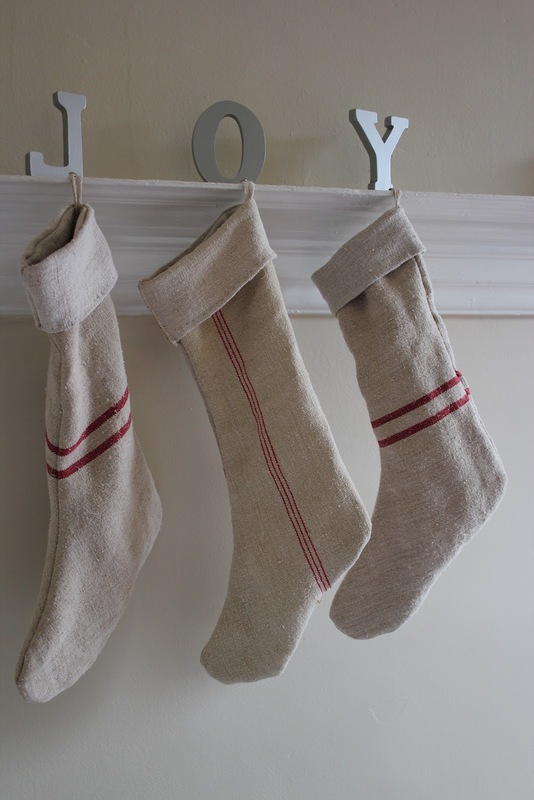 I made these stocking from vintage grain sacks. I like the rustic feel of them against the shiny letters. I found these letters at Michaels. I was going add glitter after I painted them metallic silver. But I liked the result after the first step so decided to stop there. I wanted to make them look like stocking holders. They are very light so I used upholstery tacks in front of them to hold the stockings in place. 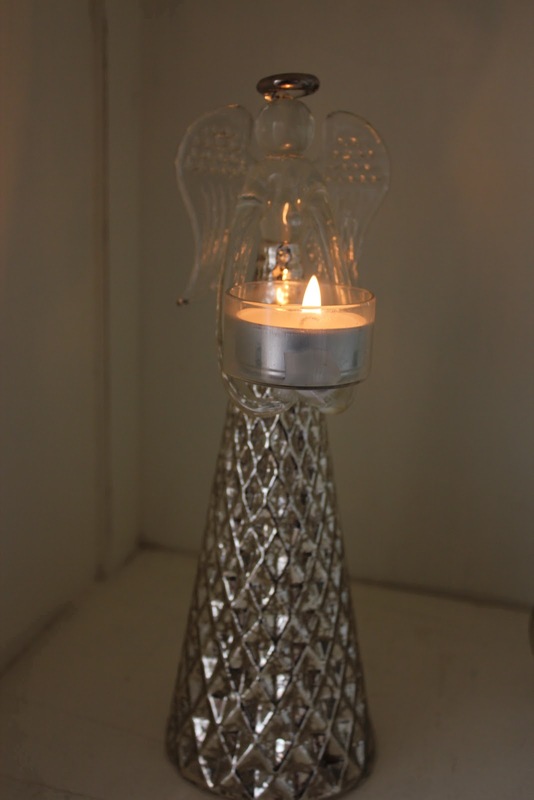 Angel mercury candle holder. I like her dress. 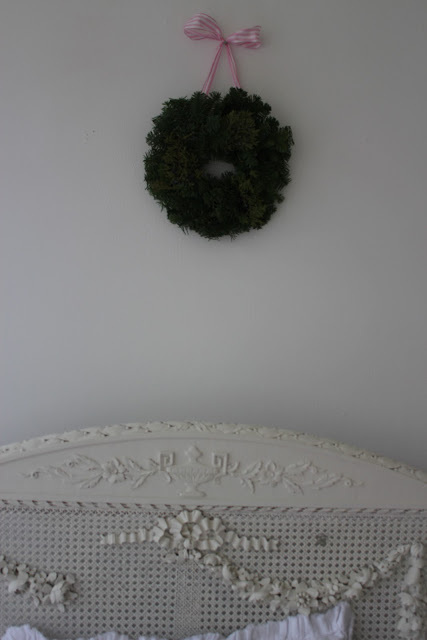 This simple wreath draws the eye to the molding in my hallway. This small wreath is sold as a centerpiece. But I added pink striped ribbon and hung above the girls' beds. One of the my favorite vendors at our local flea market sells things made from antique ceiling tins. I was thrilled when I found this piece to hang on our front door. 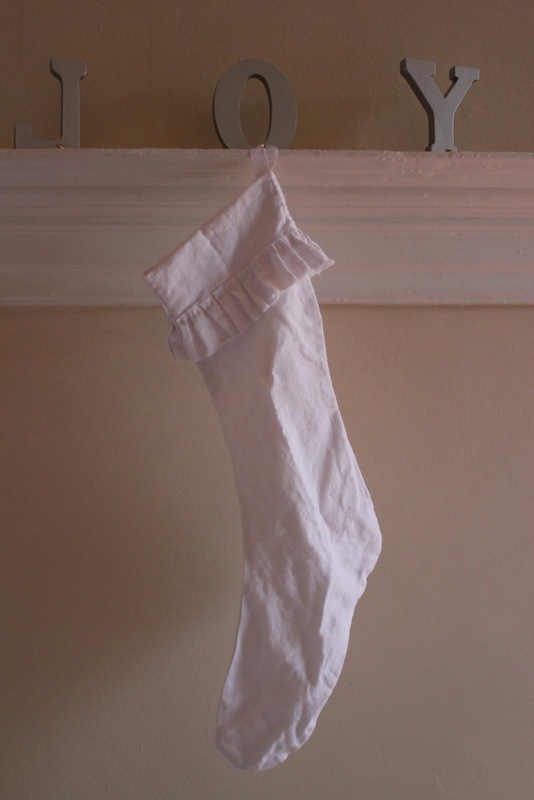 I made a few white linen stockings with a frayed ruffle which are in my Etsy store. And I wait all year to hang my C wreath. So wonderful Michele!!! I love the grain sack stockings!! I had wanted to make a few for my family but just haven't had the time to do it. Your bedroom is gorgeous! And I love the stack of linens by your bed! Aren't vintage linens the best?! Michele~ your stockings are fabulous! Love all of your holiday touches. Please share a tour of your fabulous home. I love your handiwork and it's so serene there for the girls to grow in. You've provided a very loving environment for them. Michele...I love your Holiday home. Someday, soon, I hope to make another purchase from your wonderful shop! I so love my fabulously French body pillow. I wish that the beautiful white Northern European Christmas kitchen was mine. My kitchen is the 2nd photo with the stainless sink and almond countertops. The only similarity at this time is the Swedish Electric Candlestick. Photos from her blog are all over Pinterest! Your grain sack stockings are amazing! 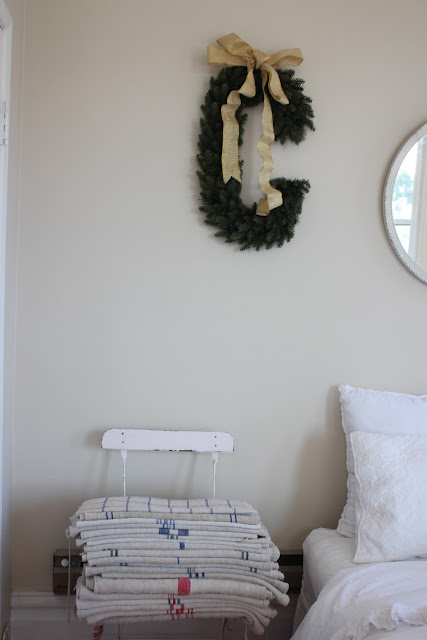 I also love how you hung the small wreath over your daughters bed...so sweet.